Home AP State CBSE CTET TG State CTET 2019 Online Application form, How to Apply? CTET 2019 Online Application form, How to Apply? 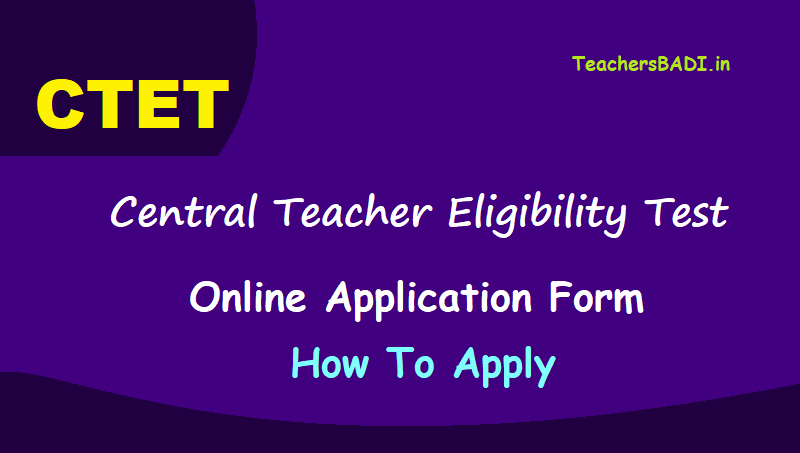 CBSE CTET 2019 Online Application released on ctet.nic.in: Central Board of Secondary Education, CBSE has started the Central Teacher Eligibility Test, CTET 2019 online application on ctet.nic.in. CTET notification 2019 was released in June 2019. CTET notification was released in the month of June. This would be the 11th edition of the CTET examination. The dates have been revised. Last date to apply for CTET 2019 is August 27, 2019. Check updates and official notification here. Direct link to apply for CTET 2019 is also provided below. CBSE CTET 2019: The online registration for the Central Board of Secondary Education (CBSE) Central Teacher Eligibility Test (CTET) has commenced and the application forms for CBSE CTET 2019 is available on the CTET official website - ctet.nic.in. " The Central Board of Secondary Education has started inviting online application for conduct of the 11th edition of Central Teacher Eligibility Test (CTET) 2019. The test will be conducted in twenty languages in 92 cities all over the country. The detailed Information Bulletin containing details of examination, syllabus, languages eligibility criteria, examination fee, examination cities and important dates will be available on CTET official website www.ctet.nic.in and the aspiring candidates are requested to download the Information Bulletin from above mentioned website only and read the same carefully before applying. The aspiring candidates have to apply online only through CTET website www.ctet.nic.in. The online application process will start by this date onwards. The last date for submitting online application on this date and fee can be paid upto below mentioned date before 3.30.p.m "
CBSE is scheduled to organize the 11th Edition of Central Teacher Eligibility Test i.e. CTET 2019 in two slots viz Paper-II – 9:30 am to 12:00 pm and Paper-I - 2:00 pm to 4:30 pm, for candidates aspiring to serve as teachers for Class I to VIII in schools that come under the purview of the Central Government (KVS, NVS, Central Tibetan Schools, etc) and schools under the administrative control of UTs of Chandigarh, Dadra & Nagar Haveli, Daman & Diu and Andaman & Nicobar Islands, Lakshadweep and NCT of Delhi..
CTET has been directed by the Union Minister of Human Resource Development, Prakash Javadekar to be conducted in 20 Indian languages this year. The decision came following the criticism received after CBSE decided to do away with 17 languages including Tamil, Malayalam, Telugu, Kannada, Bengali and Gujarati from the languages that could be used as a medium of instruction for CTET. CTET examination is scheduled to be conducted on September 16, 2019. Aspiring candidates are advised to keep track of latest updates on CTET 2019 online application on the official website, ctet.nic.in. Interested candidates can apply online on the official website ctet.nic.in . Candidates to please note that the forms would be accepted online on ctet.nic.in. CBSE has begun the online application process for CTET 2019. Eligible candidates would be able to fill application form through the official CTET website. The application link has finally been activated. The aspirants may find the CTET Notification 2019 and CTET application links at ctet.nic.in. CBSE will be holding the 11th edition of CTET on JUly 07, 2019 (Sunday) for a candidate to be eligible for appointment as a teacher for class 1 to 8. NOTE: ALTHOUGH CANDIDATES ARE REQUESTED TO TAKE PRINTOUT OF CONFIRMATION PAGE, IT IS ONLY FOR RECORD AND THEIR REFERENCE. THE PAGE IS NOT REQUIRED TO BE SENT TO CTET UNIT. Candidates are advised to check the eligibility criteria, exam pattern and syllabus before applying for the exam. Step 2: Click on the link which reads - "Apply Online"
At least two papers of CTET 2019 will be conducted and all the questions in CTET will be Multiple Choice Questions (MCQs), with four alternatives. It must be noted that a candidate willing to sit for both the posts will have to take both Paper 1 and Paper 2. Paper 1 will continue for a two-and-a-half-hour and will consist of subjects like - Child Development and Pedagogy, Language 1 (Compulsory), Language 2 (Compulsory), Mathematics and Environmental Studies. Paper 2 will consist of Child Development and Pedagogy, Language 1 and Language 2 which will be compulsory. Apart from that, Mathematics and Social Studies/Sciences paper will be taken by those who will have opted likewise. CTET 2019 exam will be conducted on September 16, 2019 and will be conducted in separate sessions for the two papers. The exam will be of two and half hour duration for both the papers respectively.